The Russian Federation Security Council is currently considering ceasing deliveries of RD-180 rocket engines for use in U.S. Atlas V rockets. Russia could be canceling its agreement to send the United States RD-180 rocket engines for use in Atlas V rockets. The Russian Federation Security Council is currently considering ceasing deliveries, an informed source from Roscosmos told Izvestia. “Americans launch military payloads with Atlas rockets. Russia used to look the other way at this, but they are starting to ask whether collaboration of this kind is appropriate,” said a Roscosmos representative. In the beginning of 1996, the RD-180 engine design of the Moscow-based Energomash Research and Development Institute was the winner of a contest for developing and supplying engines for the first stage of a modernized launch vehicle in the Atlas family. RD-180 is a modification of model RD-170, which was created for the Energiya-Buran program. In fact, the RD-180 is half of the RD-170 engine, which is the most powerful liquid-fuel rocket engine ever created; however, the RD-170 was not used after the Energiya-Buran project was canceled. According to the president of the Energiya Rocket Space Corporation, Vitaly Lopota, when the RD-170 engine began operating at the end of the 1980s, the Soviet Union was ahead of the U.S. in liquid-fuel rocket engine research by at least 50 years. Under the 1996 agreement, Energomash pledged to supply 50 RD-180 engines under contract and another 51 in an optional agreement. The United States has already received more than 60 engines at a price of $11–15 million each. Atlas V rockets with RD-180 engines are regularly used for launching military payloads. 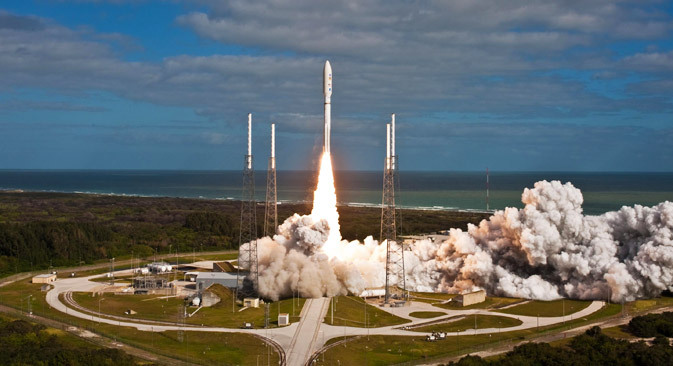 For example, the Atlas V launched the latest AEHF communications satellites for the U.S. Air Force. The Boeing X-37 experimental orbital plane was launched by the Atlas V rocket three times, the last time being in December 2012. The executive director of Energomash, Vladimir Solntsev, believes that the decision to quit exporting the RD-180 will adversely affect the company. “Right now, the RD-180 is flying only on the [American] Atlas V; it was supposed to be used on the [Russian] launch vehicle Rus-M, but that project has been canceled. If RD-180 production is halted, we will need to think about what to do with our production capacity,” said Solntsev. According to a Roscosmos source, the Security Council of the Russian Federation made formal requests to four departments — the Ministry of Defense, the Ministry of Industry and Trade, the Foreign Intelligence Service, and Roscosmos — requesting their positions on the subject of the export of rocket engines. "Roscosmos has not yet sent their opinion. This is a very complex and multifaceted issue on which it is difficult to take an unequivocal position," the source said. Earlier, the head of Roscosmos, Vladimir Popovkin, spoke out in favor of continuing international cooperation in supplying engines to the United States. "The Americans buy Energomash RD-180 engines and now are negotiating with us about the possibility of acquiring the promising RD-193 engines for developing their launch vehicles," said Popovkin in an interview with Izvestia in December 2012. "This talk sounds like a so-called pause in relations between the Russian Federation and the United States, but, in my view, this idea in particular is ridiculous," said Ruslan Pukhov, head of the Center for Analysis of Strategies and Technologies. "We ourselves benefit by working with the United States, selling them engines and then buying military equipment from the French and the Israelis. In fact, it was money from South Korea that helped us finish the new engine for Angara. The media contact for the Lockheed Martin Space Systems division, which manufactures the Atlas launch system, was not able to comment on the situation.